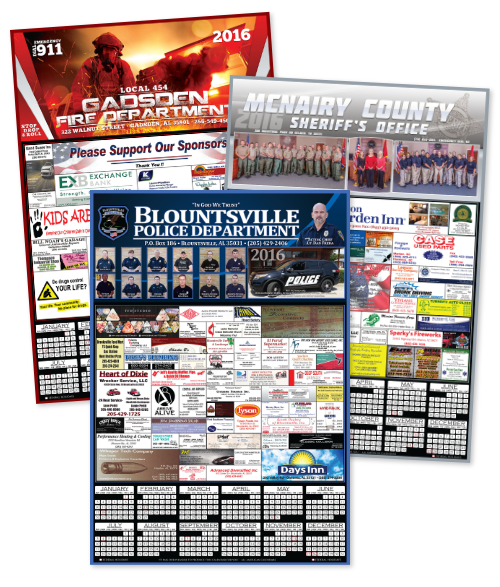 All American Calendars (AAC) is dedicated to being a calendar company that you can depend on, year after year, for high quality products, services and funds. We understand the importance of having additional funding to help support your extended efforts to better Protect and Serve the community. Because of this, we would like to offer you our 10 years of experience in generating guaranteed, up-front income for your department. Choosing a calendar project with our company will allow for you to continue with your day-to-day operations without lifting a finger. Our staff will handle every part of the project from start to finish which includes advertising sales, collections, photography, design and graphics, printing and distribution to you and each of your supporting businesses at NO COST and NO WORK required by you or your department. Thank you for taking the time to consider working with our company, and we look forward to the time we can meet in person to further discuss the benefits of creating a relationship between All American Calendars and your department. Contact our support team and they will assist you.